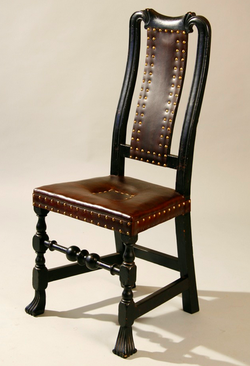 Voltaire quipped that "the armchair, the backstool, the stool […] have for centuries been important objects of political debate and the illustrious subjects of many a quarrel.” Embedded within complex social rituals and etiquette in Ancien Régime France, chairs allowed their occupants to demonstrate and affirm their rank. 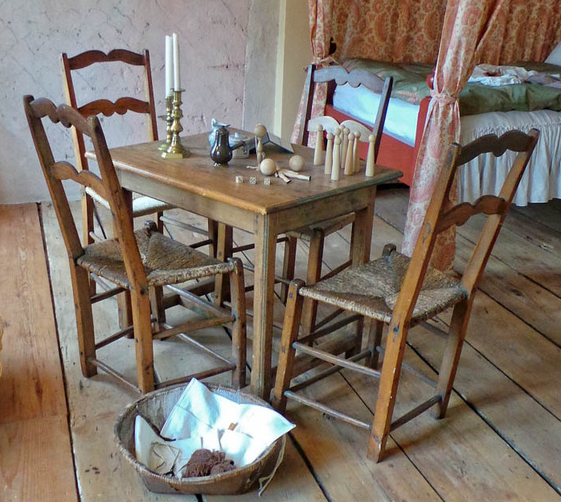 Chairs, couches, and stools were also essential accessories of elite social practice in New France. At a time when most colonists made do with communal benches, low stools, or makeshift seating in the form of chests or trunks, ownership of actual seating furniture, especially upholstered chairs, helped the wealthy and socially prominent to distinguish themselves from the rest of the population. ​Matching sets in public salles enabled nobles and bourgeois to receive according to rank and privilege, while more comfortable furnishings found in bedchambers point to the spread of metropolitan-born fashions for commodité, a principle that combined functionality with style and material well-being. For example, the 1718 succession of Pierre Têtu, sieur du Tilly, in Château-Richer lists an "old wooden armchair" used as a chaise de commodité, generally understood as a comfortable, upholstered armchair sometimes equipped with an adjustable back that could be raised or lowered. Governor-general Philippe de Rigaud owned two such chairs in 1725, and the 1729 succession of Florent de Lacetière, a Québec notary, lists a chaise de commodité. Jean Crépin, a counselor of the Superior Council, owned another chaise de commodité in 1734. The use of such specialized vocabulary in a colonial context is noteworthy. To give another example, Montréal merchant Jean-Baptiste Léonard Hervieux owned six caquetoires, roughly translated to conversation chairs, in 1747. Philippe de Rigaud's furnishings inventoried at the château Saint-Louis in 1726 followed precedents set at the court of Louis XIV. Eight French walnut armchairs upholstered in green velvet, another in crimson damask, two in tapestry, and another in daffodil-colored damask coordinated with a silk and metallic thread tapestry in the grande chambre, likely that occupied by governor-general himself. Three cherry armchairs, ten cherry chairs, and six stools, all covered in tapestry, were recorded in the bedchamber most likely used by his wife the marquise, who spent twelve years living at court. At Versailles, rights to a stool versus an armchair were jealously guarded, and it is probable that the marquise sought to recreate such courtly etiquette in Québec; the fact that she had and her husband enjoyed separate apartments in the château was the direct result of her influence over the minister of the Marine, who authorized the addition of a new wing containing private quarters for the governor-general's wife in 1721. ​Born in Tours in 1645, Sovereign Council member Charles-Denis de Vitray owned a variety of chairs in his Québec home. A mocado-upholstered armchair, two cherry chairs with turnings and feather-stuffed seat cushions, two stools covered in green cloth, and four rush seat chairs with green cushions were inventoried in his chambre soon after his death in January of 1703. In comparison, six rush bottom chairs with green cushions were inventoried in the salle, which also contained a number of armoires, four green window curtains, and a spinet. In the absence of surviving furniture, such records prove invaluable in their suggestions of ornament and style. Turned elements are a common element of "mannerist" or "Louis XIII" designs of the seventeenth century. The predominance of the color green in Vitray's choice of furnishing textiles speaks to the influence of metropolitan tastes of the seventeenth century, which favored green, red, and yellow. Leather might also be employed to outfit a prestigious chair, an example being a large cherry armchair inventoried in the cabinet of the Québec merchant-jurist François-Étienne Cugnet in 1751. Covered in Morocco leather and equipped with a cushion, this chair's appraised value of 15 livres underscores its worth compared to two "old" turned chairs with blue serge upholstery for 5 livres and four "old" rush seat chairs for 2 livres. 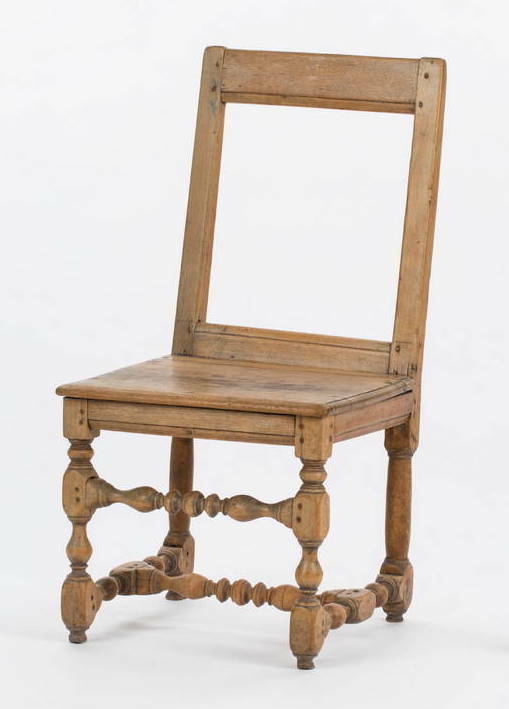 A number of French colonial inventories make reference to "English" chair frames, a likely allusion to the presence of English and Anglo-colonial furniture in New France. With their solid, geometric turnings, it is not inconceivable to envision the Boston chairs seen above used alongside French baroque style furnishings imported from the metropole or made in New France. Even the château Saint-Louis contained "English furniture," described in the 1725 inventory of Philippe de Rigaud. Upon his death in 1732, Québec merchant Nicolas Jérémie owned six "baluster" chairs covered in mocado, a likely reference to the turnings and the persistence of earlier baroque design in New France. As a major Atlantic port, Louisbourg witnessed the arrival of an important amount of "English" forms that often arrived through illicit inter-colonial trade. The 1741 inventory of goods held in common between Claude-Joseph Desmarest, a Louisbourg notary who died in 1737, and his wife Marie-Suzanne Basannière reveals the presence of a large "English commode" equipped with three large drawers and four small ones, along with six "English" chairs covered in red leather in the chambre. Another chamber contained twelve leather-covered chairs, a table, and a desk, all described as à l'anglaise. It is hardly surprising that French Canadian furniture made after the fall of New France fused French rococo style with the British Chippendale. The inventory of Marie-Anne Sarrazin, the daughter of colonial bourgeois merchants and married to the noted colonial scientist Michel Sarrazin, provides further clues on the appearance and style of elite seating. Taken in 1743, the inventory mentions four horsehair-stuffed armchairs covered in tapestry at 10 livres each in her bedchamber. The notarial team took time to record the style of the armchairs' feet as "pieds de Biche," a detail that refers to cabriole legs often terminating in stylized deer feet or hooves. This style was especially widespread in New France, and references to pied de biche chairs and tables abound in colonial records from Canada down the Mississippi River to Lower Louisiana. In France, surviving furniture with this sort of carved detail first appeared in the early eighteenth century and accompanied the development of the curving cabriole leg, a mainstay in the emerging rococo style. The relatively recent date of the style's development, combined with the increased significance and symbolism of armchairs, might account for the high value of Madame Sarrazin's four pied de biche armchairs. Madame Sarrazin's inventory also mentions four side chairs in the same room. These are identified as walnut, with turned legs and a green floral mocado upholstery covering. The chairs fetched an estimate of 40 sols per chair, or 8 livres altogether. Born out of furniture styles inherited from the previous century, the description of turned legs and feet again points to the likelihood of furniture in New France being outdated "antiques" by the time of their owner's demise. In similar fashion, the "Old stool" and its "Old tapestry" covering recorded a few lines further down were valued at 12 sols. Made in Paris by the joiner or menuisier Jean Nadal, this armchair is one of a suite of eight owned by Henri-Marie Dubreuil de Pontbriand, the last bishop of New France. It represents the height of French furniture fashion just before the fall of New France and is known as a fauteuil à la reine by virtue of its straight, square back. The eight Nadal armchairs presumably furnished the episcopal palace in Québec before the bishop left them to the Sulpician Order of Montréal in 1760; the Sulpicians still own this furniture today. 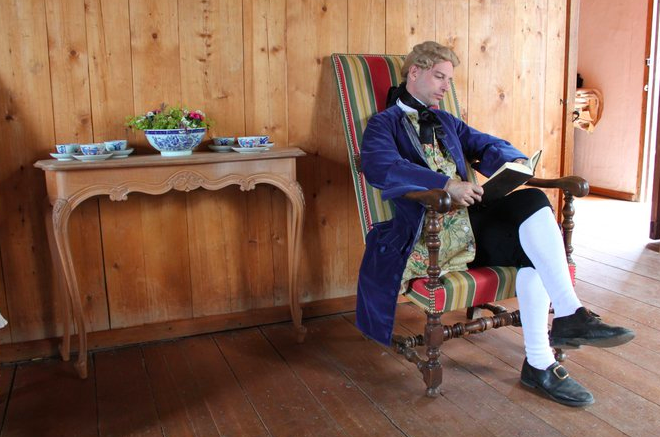 Although the armchair seen here belonged to the highest ranking cleric in New France, it provides context for the sorts of chairs owned by the wealthiest French colonists and royal officials. Governor-General Pierre de Rigaud, marquis de Vaudreuil-Cavagnal, owned similar furnishings at the château Saint-Louis. He recorded their theft after the British siege of Québec in 1759. As part of a damages claim made in 1771, Rigaud cited sixteen fauteuils à la reine of Parisian origin with petit point tapestry ﻿upholstery﻿. They had cost him 1,600 livres and were used to furnish a room in the château that he identified as the salle de compagnie. With its protective "wingback," the beech bergère seen at right recalls one owned by Marie-Madeleine d'Amours de Clignancourt in 1757. It is entirely possible that such a fashionable model could have found its way to Québec in the 1750s. Madame d'Amours' bergère was upholstered in calamanco, a thin worsted wool textile that is checkered or brocaded in the warp, and was inventoried with a matching back cushion. A fauteuil à la reine stamped I GOURDIN for Jean Gourdin, a Parisian menuisier, survives in Québec with a history of ownership by the Vaudreuil family. Seen at left, it is possibly one of the sixteen left behind in the château Saint-Louis in 1759. This armchair is owned by the musée de la Civilisation in Québec. Apart from a few very prominent colonial families, ownership of such a chair was almost exclusively reserved for a royal officer like the governor-general or intendant. Three armchairs made in Canada and seen below speak to the persistence of older forms in New France. Seen below, they feature os de mouton or mutton bone (actually horn) turnings, another reference to the artistic inspiration provided by cloven-footed mammals. A holdover from seventeenth-century Mannerist forms popularly labeled Louis XIII, such turnings were commonplace across the reigns of both that king and his son Louis XIV. The fauteuil à la capucine was especially popular in Québec and other settled parts of Canada. Tradition held that such simple forms originated in Parisian religious houses of the Capuchin order. Notarized in 1724, the inventory of goods owned by the fur trader, judge, and seigneur François-Marie Bouat and his wife Madeleine Lambert Dumont of Montréal lists eight eight cherry fauteuils à la capucine in their chambre; the seats were upholstered in tapestry. 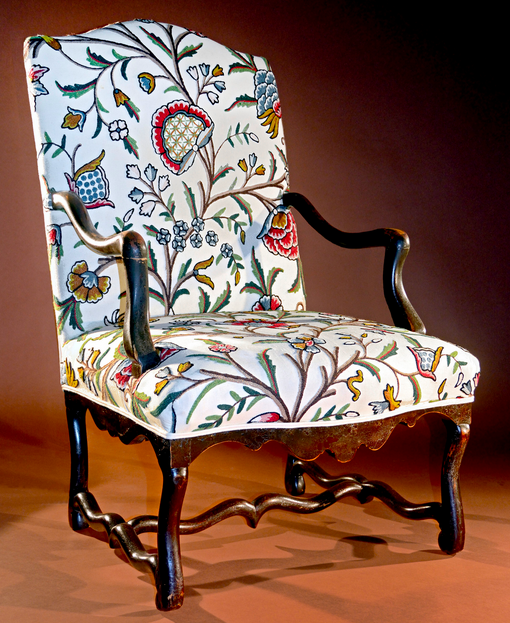 Intendant Claude-Thomas Dupuy owned a fauteuil à la capucine that was among the furnishings seized to pay his debts in 1728 and sold at auction in Québec in the 1730s. A birch example at right features the characteristic geometric turnings, scrolling or chantourné back splats, and a plain straw or rush bottom seat. A second example in maple seen below is marked by a distinctive red paint. This style of chair continued to be popular in French Canada well into the nineteenth century. Unlike rush or straw and despite its popularity in France, caned furniture appears less often in Canadian records. Two caned armchairs inventoried in the Québec home of the baronne de Narcy in 1742 are a rare exception. In response to the tropical climate, it is no wonder that twelve caned armchairs and a couch were inventoried in the salle of Pierre Tiphaine in 1764; Tiphaine served as a royal notary in the port of Saint-Pierre in Martinique. 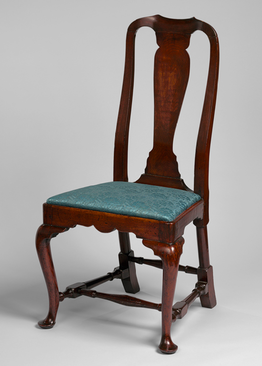 Of all seat furniture, rush and splint seat chairs were by far the most prevalent, even in elite colonial interiors, of the seventeenth and eighteenth centuries. Both of the two fauteuils à la capucine seen here are equipped with splint seats. The 1725 inventory of the hôtel de Vaudreuil, the private Montréal residence of the Rigaud de Vaudreuil family, mentions two-dozen rush bottom chairs in Governor-General Philippe de Rigaud's salle. In 1748, the salle in the house of Claude-Michel Bégon de la Cour, governor of Trois-Rivières, was entirely furnished with rush seat chairs; there were twelve in total, and no hint as to their style. As late as 1758, the only seating furniture found in the salle of Superior Council member Guillaume Verrier's Québec home was a set of eight rush seat chairs. ​Jean-Baptiste Prévost, an agent of the French East Indies Company who died in Louisiana after several decades of residence, owned an impressive amount of caned seating furniture. The 1769 inventory of his indigo plantation south of New Orleans described a caned settee, nine armchairs, and six chairs in the salle, another caned settee, seven armchairs, and six chairs in a chambre used by Madame Prévost, a caned settee and three armchairs in Monsieur Prévost's chambre, and four caned armchairs distributed between two small chambres. These pieces were complemented by an equally extraordinary amount of upholstered and rush seat furniture, including a set of twenty-four chairs and armchairs covered in Utrecht velvet, several other settees, and a large armchair with the back upholstered in damask.